2 Bedroom Flat For Sale in Manchester for Offers Over £145,000. Well positioned on the second floor of a lift assisted modern development in the ever popular Monton Village, this property is ideal for buy to let investors and for first time buyers! Recently redecorated and carpeted throughout, the property is ready to move straight into with no onward chain! 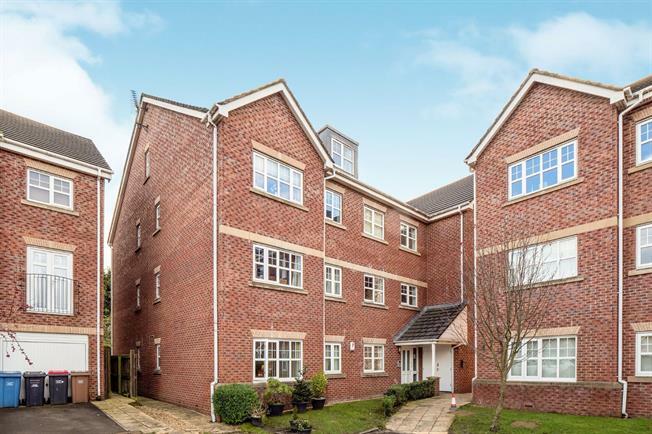 Featuring and entrance hall, two double bedrooms, spacious lounge, modern fitted kitchen with integrated appliances and a contemporary bathroom suite. The property is accessed via a secure intercom service and there is an allocated parking space. Viewings are highly recommended! Hardwood front door. Carpeted flooring. Double aspect double glazed uPVC windows facing the rear and side. Electric heater, carpeted flooring. Double glazed uPVC window facing the side. Tiled flooring, part tiled walls. Granite effect work surface, wall and base units, stainless steel sink with mixer tap and drainer, integrated electric oven, integrated electric hob, stainless steel extractor, integrated fridge/freezer and space for washing machine. Double bedroom; double glazed uPVC window facing the rear. Electric heater, carpeted flooring. Heated towel rail, tiled flooring, tiled splashbacks. Low level WC, panelled bath with mixer tap, shower over bath, pedestal sink with mixer tap, extractor fan. Storage space and hot water tank.